Bizarre, aggressive and athletic – there are few more entertaining fish than the gar. A streamlined pelagic predator, they become a regular catch to shore anglers from late summer to winter’s beginning. Following the baitfish shoals along with the mackerel; fisherfolk all around the country can quite realistically go out and catch one. But why use heavy float tackle when you can go light? This is what I’ve been discovering recently. A slice of rocket fuelled silver. We all know the float setup used for bait-fishing from piers, harbour walls etc, it’s simple, it can be used in most weather and above all it works. So why change? Well, LRF has opened a lot of people’s eyes to the sporting quality of previously underestimated or undervalued fish. Yes, gobies and scorpion fish aren’t big fighters, but hook any wrasse, flatfish or mackerel on a 1-8g rated rod and you’re guaranteed fun. This brings me to the gar, a fish famous for it’s ability to leap from the water in spectacular fashion. To me, targeting these fish on LRF tackle is completely addictive! There are so many great LRF guides online (including this one by Jamie Sandford) so I wont get too in depth here about set ups etc. All you need is a rod and reel combo that will cast a two to three gram jighead with ease. Simplicity is a core principle of LRF and for gar it is no different. I use a size eight, three gram ball weight or darting jig head. This gives me the distance required for casting and fishing through various depths, whilst also providing a small enough hook to fit inside the fish’s narrow mouth. This narrow, toothy beak can provide much frustration in failed hook-ups. Scaling down your hook size is crucial. Lure choice is varied and exciting. These days there are literally hundreds you can buy at very reasonable prices. I have slightly expensive taste though and cannot look past the Ecogear Aqua Shirasu and Katsu Aji lures. They are not cheap, you get ten two inch lures for around six to seven pound. They also rip and pull from the hook easily. Yet they get me twice the fish of any other lure at this size. This is due to the intense scent they are soaked in. I’ve found the gar will hit most lures once or twice but will carry on hitting the Shirasu or Katsu until they have it in their jaws. 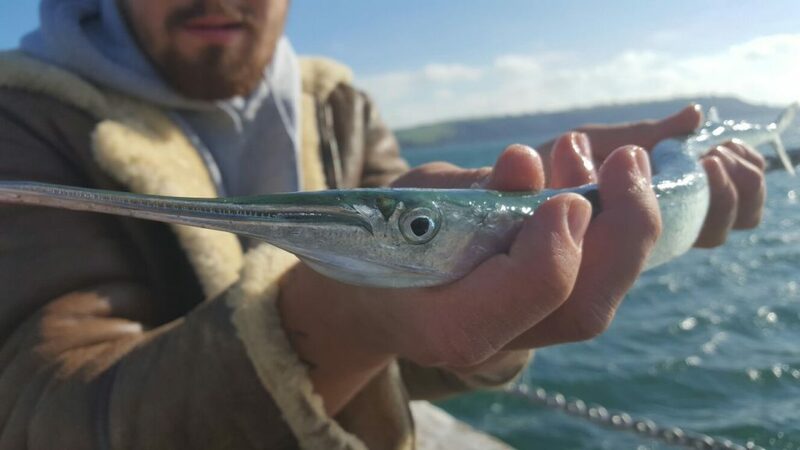 It must be about the scent and flavour, remember that we use mackerel strip (the most oily and flavourful of baits) to tempt them usually, so their sense of smell must be acute. Other scented lures also do a fine job, the Ecogear range is just my personal preference. Just try slim, light coloured lures no longer than three inches. Perfectly hooked, they can’t resist the Ecogear Katsu Aji. Location is quite probably the simplest part of garfishing. Most piers and promenades will be full of anglers targeting them in late summer, these marks will also hold fish until the weather turns properly cold and rough. A quick conversation with one of the float-fishermen normally tells me everything I need to know about how many gar are about, they are one of the more reliable fish. If there are no telltale baitfish signs on the surface, then I simply find the deepest area and work my way from there. Though they are a renowned surface predator they can always surprise you by staying deep, so covering all depths of the water can be crucial for consistent sport. Even gloomy late autumn days can provide exciting sport, in the right location. 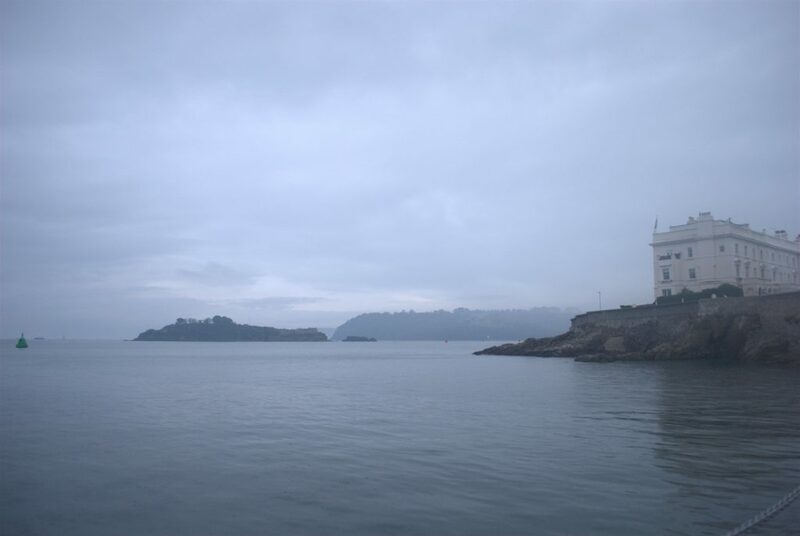 This mark on West Hoe Pier in Plymouth provides prolific fishing at times. All of this fishing is about simplicity, working with tactics and tackle that are well known and used. One truly important tip I learned recently changed my results dramatically though, and again it’s about keeping it simple. On the retrieve, as you work the water column in an erratic motion, you will get a hit or a sideways pull. The fish at this point is trying to ‘stun’ your lure so it can consume it easily. At this point do not strike, completely stop and let the line go briefly slack, then tighten the line and strike. The fish will most likely have taken the lure fully in it’s mouth, your strike will hopefully set the hook into the tough, toothy beak and the fun will begin. This obviously isn’t full proof, you will always miss takes, they are famously difficult fish to hook, but that simple tip changed my fishing from frustration to elation. The fight is, for me anyway, the reason I fish for them. They dive deep, they wriggle on the surface and best of all they leap from the water, sometimes shaking your hook at the same time. For a fish that is rarely over a pound or two they are turbocharged. With a light set up and a forgiving drag, you can have such fun with them. 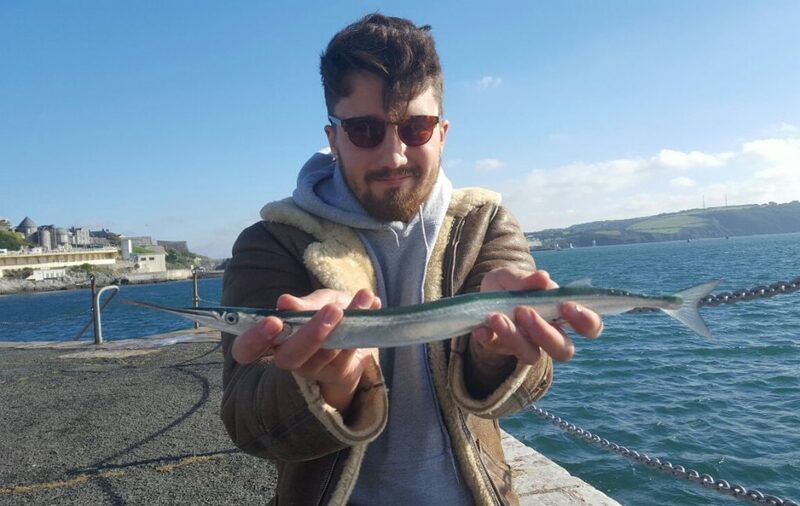 Personally I really enjoy the looks I get when I hook them, the traditional fisherman quite bemused at the bend in my rod and smile on my face, with the fish tail-walking in front of me like a tiny marlin. Classic tail-walking action from a lively gar. 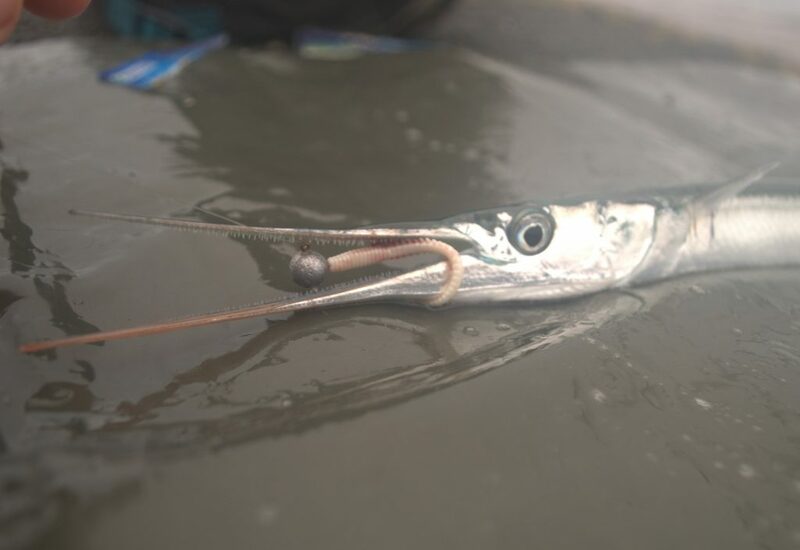 My final thoughts are as always about care, if you are a catch and release angler like myself, garfish can be tricky. They easily lose their (very stinky) scales, are prone to deep hooking themselves and wriggle like crazy on dry land. I recommend always bringing a soft rag (something like an old t-shirt does the job admirably) to hold them still with, I also try to use an unhooking mat where possible. It’s also wise to bring long nosed pliers or forceps for removing awkward hook-holds and de-barbing. I try to hold the fish firmly but fairly as I get my pictures, then quickly returning the fish to the sea. If you follow these instructions you won’t go far wrong, protecting the fish best you can so it swims away strong. So give it a try while they’re out there, if it’s your first time trying for them on LRF, I doubt you’ll fish for them any other way again. 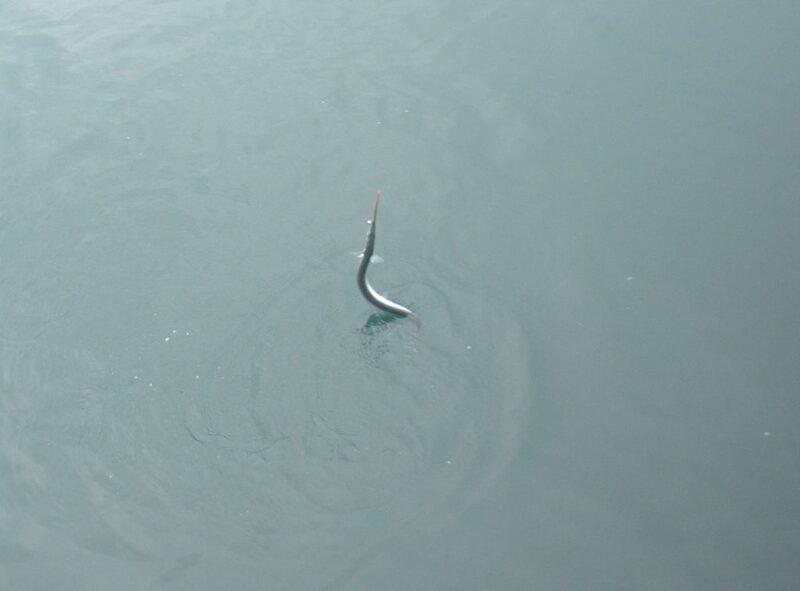 One Response to "Garfish – The LRF Acrobat"
Caught my first ones this year, didn’t realise what I was missing. Amazing sport.